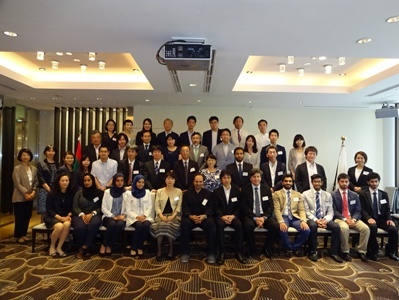 JICE conducted the 4th Internship Program for Masdar Institute(MI) 2015 and held a Final Report Presentation followed by a Farewell Party for the students from MI in Abu Dhabi, United Arab Emirates (UAE) on June 25, 2015. Mr. Omran Rashed Taryam, Energy and Climate Change Embassy of the UAE to Japan, Mr. Hideyuki Urata, Director for Petroleum Policy, Agency for Natural Resources and Energy, Ministry of Economy, Trade and Industry (METI), Dr. Alejandro Rios and Dr. Khaled Alawadi, the professors for Engineering System and Management of Masder Institute (MI) and other distinguished guests from the hosting companies attended the event to congratulate the interns on their achievement. In the Final Report Presentation, each student presented their experience and the learning through the intern program with much appreciation. They also highly evaluated the JICE foundation program which is consisted of basic Japanese, Japanese customs, social manners at office, etc. It was very useful to get used to the environment of each hosting company and to mingle with the colleagues there. The program is encouraged to be continued for the future program. 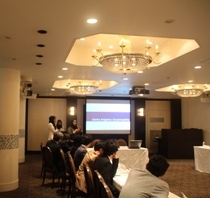 MI professors made an overall report on the past 4 Internship Programs in Japan at the end of the session and concluded the program quite useful and stimulating for the students of MI to look for the global working opportunities. 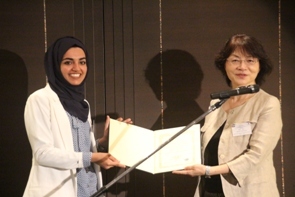 In the closing ceremony, interns were given certificates by Ms. Masako Kishimoto, Vice President of JICE, and in the Farewell party, the interns showed their appreciations to each hosting company and every person who gave effort to this program. JICE will continuously give effort to contribute to the human resource development programs of Abu Dhabi Emirate, the UAE.